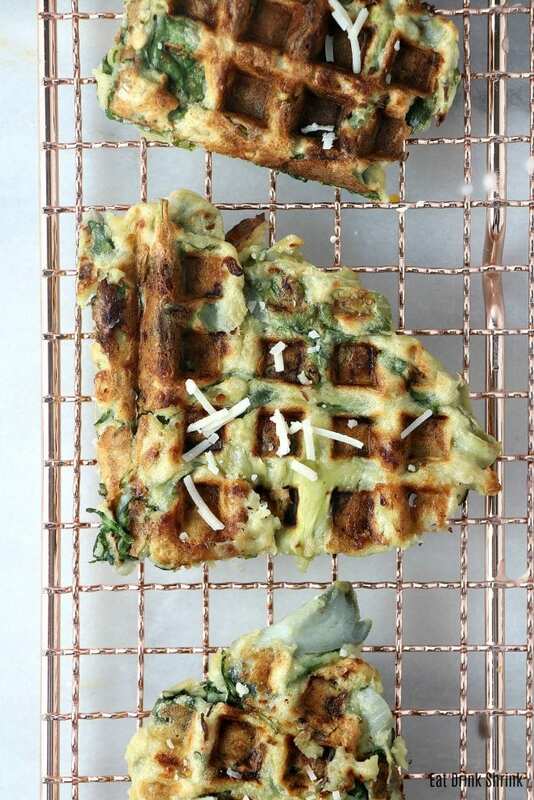 Vegan Spinach & Artichoke Waffles - Eat. Drink. Shrink. If there is one combo I love, its spinach & cheese. Throw some artichokes in there and you have pure gold! This recipe was created last year, but it’s one that stuck out in my mind even 300 recipes later, so I thought I’d showcase this seamless concept in a tutorial. Believe it or not, I’m not a HUGE waffle person. Or well, I’m very particular about them! A lot of waffle makers can simply steam them versus making them crisp. Nobody wants soggy waffles. However THESE waffles, come out crispy & cheesy and are super easy! 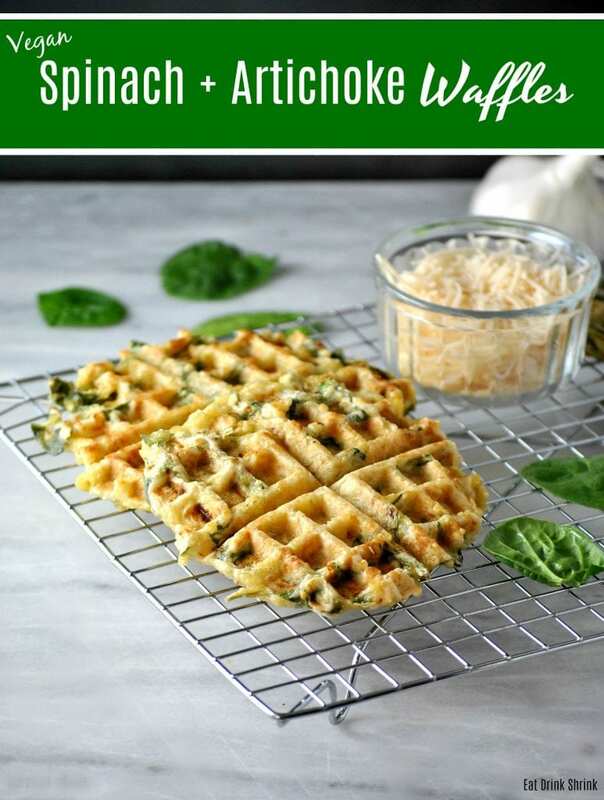 What I love about this recipe for Spinach & Artichoke waffles is that they are effortless, quick, have minimal ingredients, can be served with whatever dipping sauce you like, cheesy, great for entertaining, affordable and just all around amazing! If you’re looking for a foodie concept that looks gourmet, but can be made in minutes.. You have to try my recipe for vegan Spinach & Artichoke Waffles! Preheat your waffle maker to a medium setting (if available). In a large bowl, whisk together the vegan egg, almond milk. In a small bowl, combine the flour, onion powder, sea salt, nutritional yeast and garlic powder. Add the vegan egg mixture to the flour mixture. 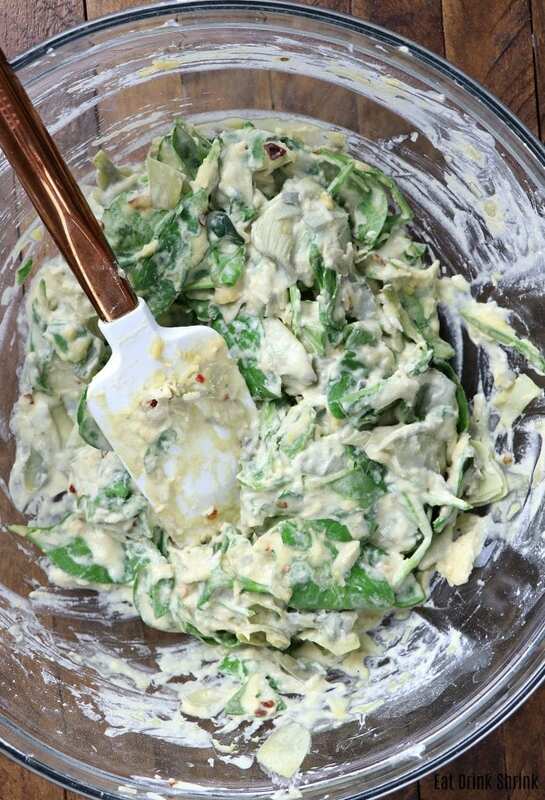 Once the batter is thoroughly mixed, add in the chopped spinach (or you can leave it whole) and chopped artichokes until everything is well combined. Spray or coat your waffle iron with olive oil. Place 1/2 cup of the batter on the waffle iron, leaving room for them to spread slightly. Close the lid and cook until lightly browned, about 3-5 minutes.Serve warm and sprinkle waffles with remaining parmesan cheese. Serve with vegan sour cream and chives.